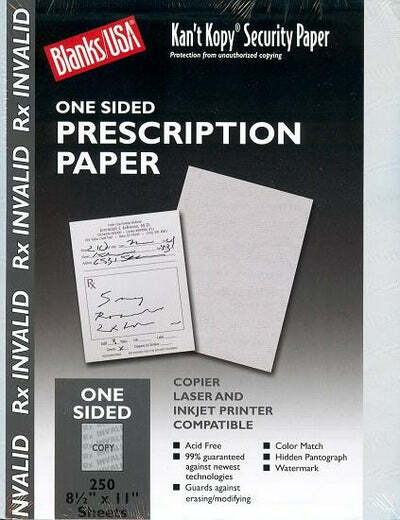 This blank Grey one-sided prescription paper is great for creating your personalized prescription papers for your practice. This prescription paper does not allow copying of any sort. It is guaranteed 99% to guard against the newest technologies in copying / erasing / modifying. There is a watermark with a hidden pantograph that only appears when the document is copied, therefore only the original paper is legitimate! When copied, a watermark will appear across the document saying "RX INVALID", indicating that the sheet is a copy of the original. This paper is copier, laser, and inkjet compatible!